Dr. Rebecca Ference Chopek grew up on her family farm just east of Consort, Alberta. She has been passionate about optometry since she was 17 years old and started working in optometry clinics on her summers off from school. 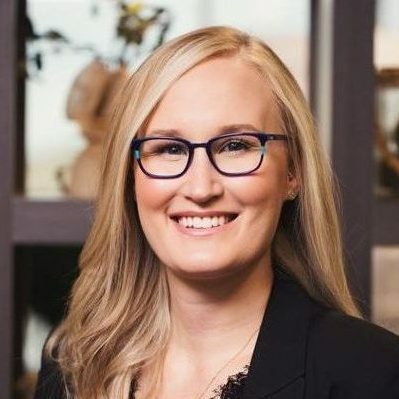 She obtained her Bachelor of Science degree from the University of Alberta before earning her Doctor of Optometry from Western University of Health Sciences in Southern California. Recently, Dr. Ference and her husband moved to Wainwright and are thrilled to be living close to their home communities in rural Alberta. She is very grateful for the incredible opportunities she has had and the places it has taken her but she is happy they led her back to the small town lifestyle she grew up with. In her free time, Dr. Ference enjoys spending time with family, friends and her two dogs, especially if that involves sunshine and a beach. Dr. Ference is happy to see all types of patients from infants and children to seniors, whether it is for an annual comprehensive eye exam or management of dry eye, glaucoma, macular degeneration, cataracts or diabetes. In the future, Dr. Ference hopes to increase public awareness of the importance of routine eye exams to ensure proper health and development of your eyes, and early detection of diabetes, high blood pressure, and other systemic conditions.